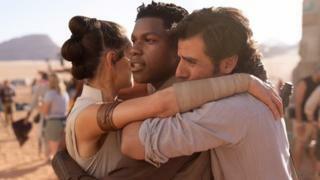 Daisy Ridley, John Boyega, and Oscar Isaac share a big hug on the set of Star Wars Episode 9. Star Wars: Episode IX has finished filming, so what will happen to Rey, Finn, Poe and Kylo Ren? The ninth movie, which is yet to have a title, is the final film in what's been called the 'Skywalker saga.' On twitter director JJ Abrams and actor John Boyega shared a photo and thanked the cast and crew. "That's a wrap on Star Wars episode 9 and the end to a chapter of my life that I couldn't be more thankful for," said Boyega. "What a process! It really has been a joy to be in these movies surrounded by amazing people. JJ thank you for making my dreams come true." The photo in both tweets shows actors Daisy Ridley who plays Rey, John Boyega who is Finn, and Oscar Isaac who plays Poe Dameron. They're all having a big hug in the picture on what appears to be a desert background... Could it be the planets Tatooine or Jakku? More things we know about Star Wars Episode 9. The Solo Star Wars trailer! What can we expect from Star Wars Episode IX? Unlike The Last Jedi, which picked up exactly where The Force Awakens left off, it has been rumoured that the new film will take place a few years on from the events of The Last Jedi. One of the reasons for this is that Carrie Fisher, who played Princess Leia, sadly died in real life before filming. However, everyone's favourite space princess will still be in the new movie, as the film-makers are using unused footage from the previous Star Wars films. Carrie Fisher isn't the only original trilogy actor making their return, Mark Hamill will be back as Luke Skywalker, while Billy Dee Williams joins the cast, coming back as the smooth talking Lando Calrissian. Whether we see any characters from the prequel films remains to be seen, many fans have speculated that Darth Vader/Anakin Skywalker could come back as a force-ghost. As for our new heroes, it's likely we'll learn who Rey's parents really are. Were they truly nobodies, like Kylo Ren told her, or could she be related to the Skywalkers? Speaking of Kylo Ren, will he turn to the light side of the force? Is this the last Star Wars? After this movie, it's not clear what direction Disney will take Star Wars. Although popular with fans, the spin off film 'Solo' didn't do well at the box office. So, for now, possible movies about Obi Wan Kenobi or Boba Fett have been shelved. There will be more Star Wars on TV too, Disney is launching it's own streaming service Disney+, and we can expect shows such as The Mandalorian and a Rogue One prequel. Star Wars Episode IX comes out in December 2019. Star Wars: Five things we know about Episode 9! In the Solo or So-high, it says the lightsaber was only turned on 3 times in A New Hope, but it was actually turned on 4 times! Sorry to be a pain. OMG so excited! It really is too long too wait! I reckon it'll be a great end to the newest Star Wars Trilogy. I think there's gonna be some BIG surprises in store! I hope I can wait that long! By the way, I have no idea. Just theories! Hux is going to try and overthrow Ren. Ren's going to reform like Darth Vader and sacrifice himself. Ray is Kylo Ren's sister, and Han Solo's and Princess Leia's long lost daughter. Something's going to happen to Leia. The Resistance is going to win. Luke's going to come back as a Force-Ghost with Anakin and maybe Ewan McGregor as Obi-Wan. There's a MASSIVE plot twist with the First Order. I love stars wars so much. Please don't make this the last one.